One key aspect of giving good service is knowing your customers well. And what better way to get to know customers than to meet them personally. This was one of the main ideas behind the company trip AuPairWorld took at the beginning of September to visit Dublin, capital city of Ireland and a highly popular au pairing destination. Twenty-five employees from all segments of the company flew to Dublin for a three-day fact-finding mission. Of course, it was important to talk with both au pairs and host families while we were in Dublin. And, of course, we wanted to have some fun with our users in these two key groups while they shared information and impressions with us. On Saturday morning 10 AuPairWorld employees joined with a group of approximately 40 au pairs from all over the world who had got to know their host family on our website. We took a marvellous guided trip through the streets of Ireland's lively capital. During this time we learned so much about Irish history, architecture and mindset thanks to our passionate and knowledgeable tour guides Cirian and Patrick. We got an entertaining glimpse into the most pivotal moments in Irish history, which were told in an incredibly humorous and lighthearted way like only Irish people can. The tour started at Barnando square next to the City Hall and led us to the key sites of Dublin. We stopped at Dublin Castle, Christ Church Cathedral, Trinity College, we went past the life-like statue of Molly Malone (with her wheelbarrow) and reached the cultural heart of Dublin city, the famous temple bar area (with its pubs, galleries, restaurants, street artists and live music). No wonder that this was the last spot of our 2 hours tour. After posing for a great group photo, we lingered in a bar, to hear in more detail about the experiences of the au pairs and to enjoy some delicious finger food and refreshing drinks. We were more than honoured to get this chance to meet the au pairs personally. It was nice to shake hands with them and learn more about their expectations with regard to their au pair stay as well as their past au pair adventures. We were also glad to get their feedback about our services, which provided us with some interesting food for thought. 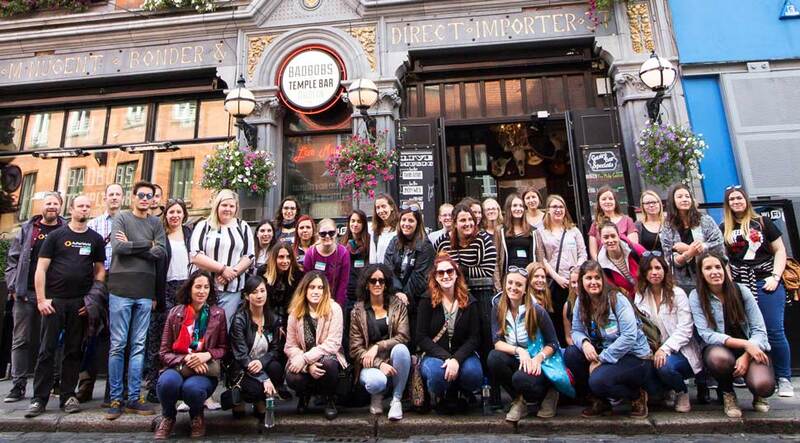 Last but not least we would like to give a big thank you to all the au pairs who showed up and had a great craic with us exploring Dublin. While the one part of the AuPairWorld team was out with au pairs touring Dublin, the other remained at our hotel base to meet with interested host families. Dublin-based host families had been invited to come together with their kids for a relaxed breakfast get together. Over coffee, cereal and croissants, we had the chance to listen closely as host families told us in detail about their experiences hosting au pairs in Ireland. It was great for us to receive first-hand feedback from this group of engaged families, and a pleasure for us to get to know them personally. It was also encouraging to hear that families are continuing to find mutually beneficial ways to work together with international au pairs even with the introduction of workplace rules that many families (and au pairs) feel don't correspond properly with the au pairing situation. With balloon artist entertainment for the kids and lots of interesting subjects for the adults, our breakfast meeting extended on into the lunch hour. Finally, though, it was time for the families to get on with their weekends, and for the AuPairWorld team to head back to Germany. It was a great opportunity for us to hear from our customers and to meet some charming families in the midst of the au pair adventure. Our heartfelt thanks to them for finding the time to spend with us!